January 22nd, 2015, Charlottetown – P.E.I. short-track speed skaters raced into 2015 at the region’s first meet of the year in Hampton, N.B. recently. The seven skater Island contingent captured three medals at the one day event which featured over 100 skaters from six clubs. Andrew Binns (right) of Stratford was one of three P.E.I. medalists at a recent short-track speed skating meet in Hampton, N.B. Photo courtesy of Duncan McSporran. Andrew Binns took a bronze medal in Division 1, as did Liam Chatfield in Division 4 and Alex Rogers in Division 5. For Binns, it was his first medal while competing in the top division on the regional circuit and fourth medal in as many Atlantic meets this season. Chatfield, of Charlottetown, grabbed his third medal of the season after a pair of personal best times. Rogers notched an A Final win in his 300 metre distance, on his way to a second consecutive off-Island medal. Peter McQuaid recorded the fastest times for the Island team, returning from injury to finish 4th in Division 1. McQuaid will be one of eight Island skaters wearing P.E.I. colours at the Canada Winter Games in B.C. next month. Also competing for P.E.I. in Hampton were Thomas McQuaid, Kyle Connell and Zachary Chatfield. Seamus Smith of the St. Croix Blades finished as the top male and Alyssa Rusk of Fredericton was the top finishing female skater at the Hampton meet. P.E.I. 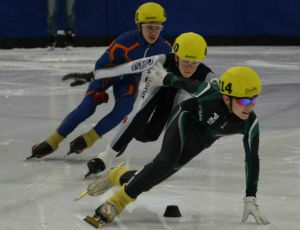 speed skaters are now looking forward to their next meet in Dieppe, N.B. on January 31 and February 1. Over thirty Island skaters will compete in Dieppe, as the P.E.I. contingent looks to win the overall medal crown in Dieppe for a third straight year. The P.E.I. Canada Games squad will use the meet as their final tune-up prior to the Games, while Island Masters competitor Rob Binns will be preparing to take on an international short track field at the Winter World Masters Games in Quebec City in early February.